Posted in: Labour, People, Politics. 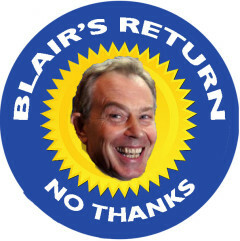 I mean why would Tony Blair want to come back to help Miliband, it’s interesting Blair went to the right he was a gent who did what he wanted and made sure he got what he wanted, he then walked away before the wars ended. Now he wants back in why, to perhaps be seen as being the gent who won it for Miliband then Blair would say look you need Miliband’s ear , I’ve got it, without me Miliband would not have won. Pay me ex amount of Millions and I will see what I can do to help you Mr Mugabe, or whom ever. The issue is can Miliband do it alone will the voting public think he is an asset or a liability. We will see…if Miliband wants him needs him then he will be in, if not he’s history. Well every one knows that they were working for the City and now have very lucrative salaries from JP Morgan (Blair), and Lazard investment bank (Mandelson). Blair, Brown and Chairman Mandy Mao Mandelson should all rot in hell. Blair with his third way, Brown with his dodgy growth theory and Mandy with his Mao like quip to bankers to get rich and pay your taxes was a green light to the City to let their Ponzi Scam rip. Thatcher gave them the right to create money and New Labour turned it into a duty. By the time the thirty-year bubble burst the bankrupt banks owed their creditors £6.7 trillion. Three or four times the national debt. All that fake money paid for a consumer boom of unprecedented fury. Now it is time to pay the piper and the entire economy of Britiain is being liquidated, asset-stripped and monetized and its currency thoroughly debased in order to bail out the bankrupts. This is in fact the mechanism by which we are undergoing the greatest redistribution of wealth from poor to rich possibly in human history and certainly since the enclosure of the commons. This is New Labour’s legacy. This is Blair, Brown and Mandy’s contribution to human emancipation.